A graceful Japanese bridge spans the lily pond, willows and water lilies adorn the banks, and the sunlight plays in the dense foliage of the trees-thus did Claude Monet (1840-1926), the preeminent French Impressionist, paint his garden, which he laid out himself during the 1880s and 1890s in the village of Giverny in Upper Normandy. Since then, Giverny has become a place of pilgrimage for artists, art historians, and garden lovers-as well as for photographer Elger Esser with his gifted eye for the beauty of French domestic landscapes. Interestingly, he chose to photograph the enchantment of blossoms and water at dusk or by moonlight and in black and white. The magic of the place is retained and even heightened by a sublime moment that evokes a bygone time, an artistic vision that took form more than 100 years ago. 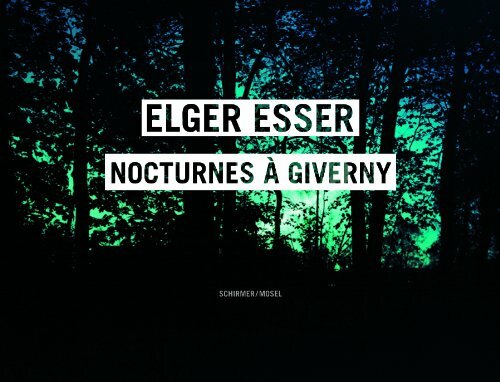 Art historian and literary scholar Hubertus von Amelunxen wrote the introductory essay on Elger Esser's Giverny series, which was taken in 2010.